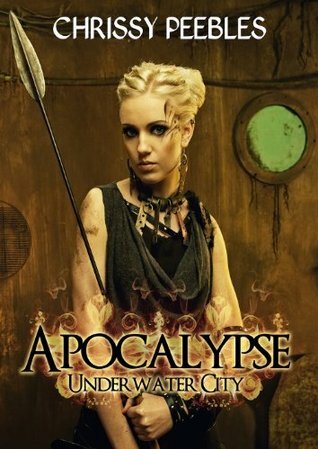 The synopsis says that Apocalypse: Underwater City is dark and upon reaching the end, I don't think it could have been described in a more inaccurate fashion. At best, Apocalypse: Underwater City is twee. It's only three years old but the pop culture references already feel so damn antiquated. Look, I'm a nineties girl and totally love the Smashing Pumpkins, but never has the lyric "Despite all my rage I am still just a rat in a cage", been so misused. We get it, Sky feels trapped but we don't understand is why exactly, despite repeatedly being told by Skye that this is how she feels. We are told repeatedly that Sky has a boyfriend who she loves dearly. Sky however seems to attract the attention of others. One man clearly interested in her gives her diamond earrings for her 16th birthday which Sky rejects because she deems them to be too valuable. In an apocalypse, why would shiny rocks (essentially what diamonds are) be of any value at all? Also, how the hell did he come across them? Sky's boyfriend Brett gifts her with a mood ring which she apparently knows all about despite being born and raised in this bubble. There's also no explanation as to exactly how he came across the mood ring. Then there's Sky and her BFF Rachel, using makeup to cover their sunburn. Where the hell did the makeup come from and furthermore, don't they realise that putting makeup on damaged skin will only make it drier and flaky, thus revealing to the public that something is wrong with their skin? So people packed for an apocalypse and somehow brought makeup, diamonds and mood ring with them? There's suspending belief and there's just author stupidity. Sky keeps receiving flowers and potted plants from a secret admirer. Rachel and Sky worry that this will make Brett feel jealous. What I cannot help but wonder is why, I as a reader should give a damn about this clear case of filler. Sure, Peebles probably goes somewhere with it in the next book but given that Apocalypse: Underwater City was meant to hook me into the series, I'm not the least bit interested in finding out who could probably have departed so far from their common sense enough to take an interest in Sky, nor am I interested in Brett's possible jealousy. There are several female characters and Apocalypse: Underwater City actually does pass the Bechdel test. Sure, Sky and Rachel do spend an inordinate amount of time talking about men and boys but they also discuss Sky's belief that they are being lied to and controlled. In fact, when Rachel and Sky aren't talking about men, this is all they talk about, making it feel heavy handed and repetitive. There are no characters of colour or LBGT characters probably because that would take far more imagination than Peebles actually possess. This book is easily skipable and I recommend that if you get the opportunity to read it, you just keep moving. If some friend gives it to you, I would take it as a sign that it might be time to reevaluate that particular friendship. The only saving grace of Apocalypse:Underwater City is its brevity. The only reason that this book isn't a DNF is because of how short it is and still it was tortuous to make my way through. Please consider yourself warned.